Mary Beth Nolan - For Shaw Media "The Blind Side" actor Quinton Aaron hugs McKenzie Human of Marengo during a fundraiser at Glo-Bowl Fun Center in Marengo Saturday March 5, 2016. Through his foundation Aaron speaks out against bullying. 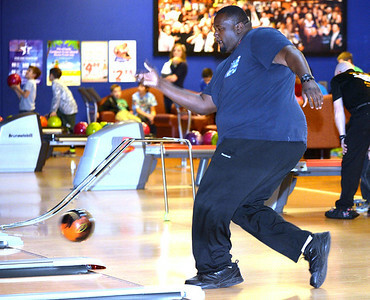 Mary Beth Nolan - For Shaw Media " The Blind Side" actor Quinton Aaron tries to pick up a spare while bowling during a fundraiser for his foundation at Glo-Bowl Fun Center in Marengo Saturday March 5, 2016. Through his foundation Aaron speaks out against bullying, something he endured in his childhood. 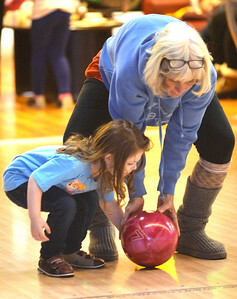 Mary Beth Nolan - For Shaw Media Patty Kling helps her 3-year-old granddaughter Olive send the ball down the lane during an anti-bullying fundraiser with "The Blind Side" actor Quinton Aaron at Glo-Bowl Fun Center in Marengo Saturday March 5, 2016. 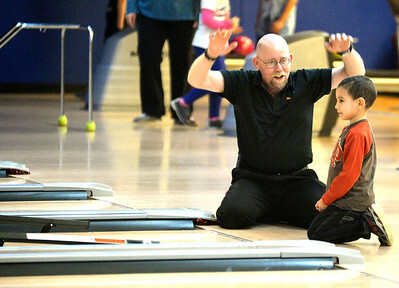 Mary Beth Nolan - For Shaw Media Bowling pro Steve Macygin congratulates new bowler Carlton Darrell of Merrilville, Ind. 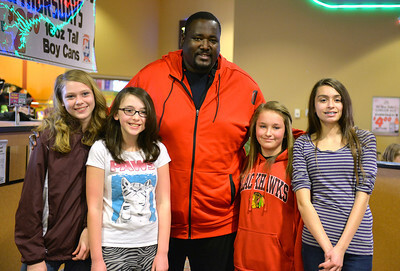 during an anti-bullying fundraiser with actor Quinton Aaron at Glo-Bowl Fun Center in Marengo Saturday March 5, 2016. Through his foundation Aaron speaks out against bullying. "The Blind Side" actor Quinton Aaron hugs McKenzie Human of Marengo during a fundraiser at Glo-Bowl Fun Center in Marengo Saturday March 5, 2016. Through his foundation Aaron speaks out against bullying.